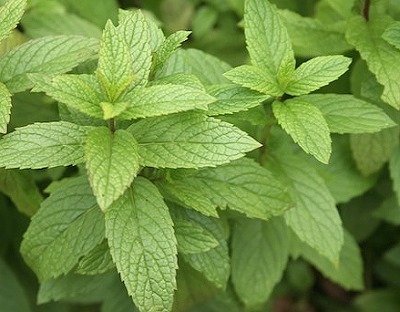 Macho Mint is so called because it is extra tough, extra tasty and extra abundant. Macho Mint was bestowed upon us by our good friend Jim Long who owns the extra herby Long Creek Herbs. Jim has been using this mint, which grows wild next to his spring near Blue Eye, Missouri, since the late seventies to make the deliciously refreshing mint tea he serves his guests who visit his gardens in the summer. According to Jim, to make his tea you need to harvest a generous handful of mint: stems, leaves and all. Then wad it up and squeeze it a bit like you would squeeze a wet dishrag. Put that wadded-up, squeezed mint ball in the bottom of a half-gallon pitcher. Fill the pitcher completely to the top with ice, then fill that to the top with water. In 5 minutes you have the most refreshing iced mint tea you have ever experienced! Macho Mint blooms in the middle of summer. Jim likes to harvest just the blossom heads and dry them for winter mint blossom hot tea. Jim is also real fond of this mint because it holds up well after frost, when all of the other mints have died down. He likes to to pick frost-or even ice-covered leaves, and munch them when he is doing fall garden clean-up chores. Macho Mint is also the first up in the spring in his garden. Really what more could you ask, (except maybe a trip to Long Creek Herbs)? By the way, Jim is a terrific author as well as an accomplished and inquisitive gardener. Be sure to check out all his books. This plant is often available in plug trays. These trays hold 128 of all the same plant. They are a great low cost way to fill a lot of space. Each cell is 3/4 of inch by an inch. Check here to see if Macho Mint Plug Trays are available.